For the last several years, the Internet has been a game-changer for anyone with the drive to be a self-employed, traveling freelancer. Every day another non-retired RVer hits the road for a life of adventure, like Kelly and Stephen Brown. These young full-timers from Florida recently said goodbye to their traditional stick house existence and shifted gears into full-time RVing with their three dogs. For years Kelly and Stephen had enjoyed the benefits of suburban life, but several years of the daily grind finally got to them in 2015. 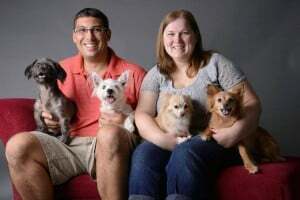 “We came to the realization that life wasn’t quite working out for us the normal way,” wrote Kelly in the couple’s blog. Returning home from vacations was always a letdown and no time away from their routine was ever long enough. “We simply were not happy doing the 9-5 most of the year with only a few weeks to ‘be ourselves,’” she says. Stephen and Kelly Brown with their four-legged traveling companions. Something had to change, but they didn’t know exactly what. They thought about a life of full-time travel but as dedicated dog parents, worldwide vagabonding was out of the question. While pondering all the ways they might find their happiness in the greater world, an intriguing option appeared on the horizon: RVing. Although they knew little about the lifestyle, the one thing they knew for certain was that RVing was the perfect way for the whole pack to see the country and all the adventures new scenery could bring. The timing for Kelly and Stephen’s revelation was perfect. His job as a software developer was as portable as jobs get, while her online gig scoring the written responses to standardized tests was also something that could be done anywhere as long as they had an Internet connection. 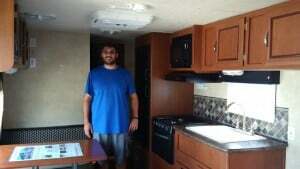 With friends and family cheering them on, they started looking for their first RV. As meticulously as a computer programmer, the couple approached the decision with a plan and clearly defined personal goals. Stephen in the living area of their RV. “We had a few considerations when choosing our RV. We didn’t really know anything about RV’s and we didn’t want to invest a ton of money into something that may not work out. We already had an F150 truck so we thought it would be better to try and find something that would allow us to utilize that. Since the F-150 doesn’t have a super-high tow capacity that limited our choices. Closing the sale on their new home on wheels. 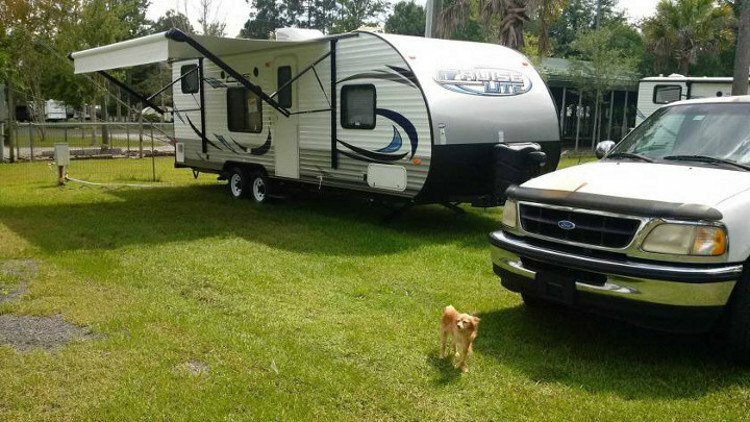 Five RVs later, they found the perfect trailer: a 2015 Salem Cruise Lite 261BHXL towed by a 2015 Chevy Silverado 1500. In a careful approach to the big change, they decided to stick close to home in Florida before heading out on longer trips. Over winter they stayed at nearby campgrounds in order to get acquainted with Vera. As any new RVer knows, there’s a learning curve with minor disasters that eventually make great campfire stories. From draining their batteries down too low to glitches creating a solar system for the RV, Kelly and Stephen’s first winter was filled with some challenging learning experiences but not enough to deter their dream. Some lessons were more useful than others, according to Kelly. 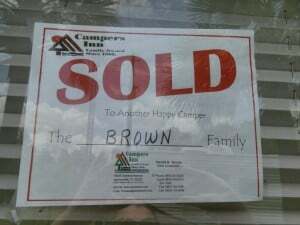 RVing forums have been their best ally in finding solutions. “We recently fixed an issue with our hot water heater not actually providing hot water,” says Kelly. The couple learned from RV discussion forum members that the problem could probably be traced back to the dealer. Sure enough, they determined that the cold-water bypass valve was left partially open from the factory, causing cold water to get mixed in with the hot coming out of the heater. “We fixed this and we are definitely not what you would consider handy people,” she said. With summer beckoning, their new life is taking shape. Soon their long-awaited cross-country jaunt will kick off and Kelly and Stephen can use their new RVing knowledge to their advantage. Even after a just a few months, these young full-timers already feel the benefits and joys of living in a smaller, portable home with less stuff. 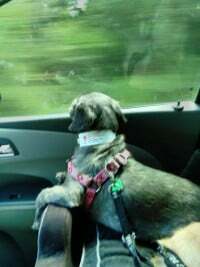 Enjoying the new scenery on the road to adventure. Even with their three dogs– Lily, Roxy, and Daisy–in the trailer, the couple finds that their life is much less cluttered than before. “We like that we know exactly where everything is in our home,” she explains. “For anything you name, we can generally put our fingers on it within seconds. When you have such a small space for your stuff, you tend to know exactly what you own and where it is. In our house, we were constantly looking for things it seemed. We had so much more stuff and most of it sat unused because we had forgotten we even had it,” she says. Their freedom from too many possessions has also enhanced their life on a spiritual level too. “Stephen says he feels more connected with his daily existence, more focused, and more at ease with life in general,” shares Kelly. RVing has so clearly breathed new excitement into their days that Kelly and Stephen’s family members have caught the RVing bug too. “A few months after we bought our Vera, my brother and his wife decided to go ahead and buy an RV to try and make this lifestyle change. Our young nieces and nephews were a little confused about the concept at first but have since become very interested in RVing,” Kelly says. Full-time RVing isn’t for everyone, but for this pack of five, it’s been the best decision they ever made. With an open-ended schedule and spontaneous fun ahead of them, Kelly and Stephen are reaping the joys of a lifestyle that can literally take you anywhere you want, with all the comforts of home. Not my exact story, but I gave up a two bedroom home to live in the woods on the back of 25 acres. One dog which is enough I have 20 visiting goats so that’s enough pets. Living in a 19 foot camper has its ups and downs, you stop and think before you plug anything in, I store water in jugs hidden under a chair, I have a huge rain barrel and a well, but hate the taste. I’ve had the electric go out in part of the camper, hot water tank replaced twice before we found a propane leak, so I can’t use my stove top. Been without heat, hot water, electricity for up to 3 weeks, and living miles from any one at seventy years old its been a trip. On top of the mountain, there are wild hogs, deer, dogs, and now snakes I live in Texas and lately the lighting storms have almost flipped this baby. But when its a beautiful clear day like today after a horrible storm, I love it…. Mari, you are so adventurous! I call it cheap…it is fun to look out my door and see a tree tunnel through the woods and all the birds, lizards and critters here. At least it gives me time to write and enjoy the peace and quiet. I admire you Mari. I have 6 years to retire. I plan to sell all but my car, purchase my class A and head west. I would do it now, but have a son still in school and he likes it here in TN. But I often think about your way of life and it seems as though God meant for us to live happier than most of actually are don’t you think? Cindy you put it perfectly. The pursuit of happiness is infinitely more valuable than the pursuit of money. I never would have believed it until I hit the road and never looked back.